Temple Academy senior acknowledged for scoring his 1,000th point in basketball. 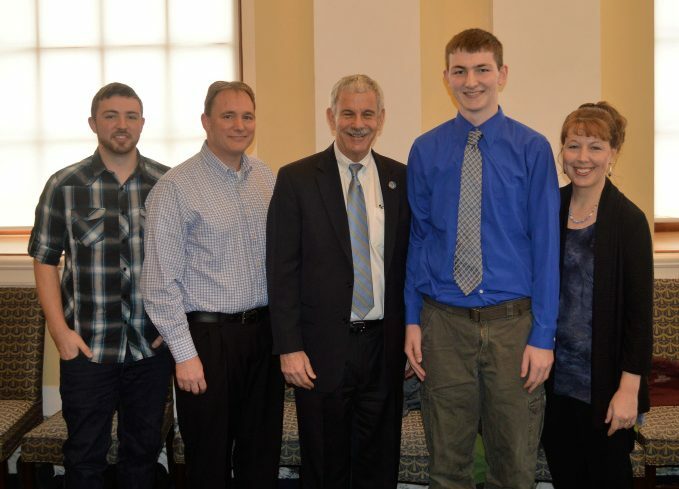 AUGUSTA — Brad Smith, a senior at Temple Academy in Waterville, was presented with a Legislative Sentiment March 21 during session in the Maine Senate by Sen. Roger Katz, R-Augusta, recognizing his accomplishment of scoring his 1,000th career point in basketball, according to a news release from the State House. Contributed photo Brad Smith, a senior at Temple Academy in Waterville, was presented with a Legislative Sentiment March 21 during session in the Maine Senate by Sen. Roger Katz, recognizing his accomplishment of scoring his $1,000th career point in basketball. From left, are Eric Smith, Gary Smith, Sen. Roger Katz, Brad Smith and Patricia Smith.